HUGE PRICE REDUCTION!! Brittany model villa located in Stoneybrook Golf & Country Club. 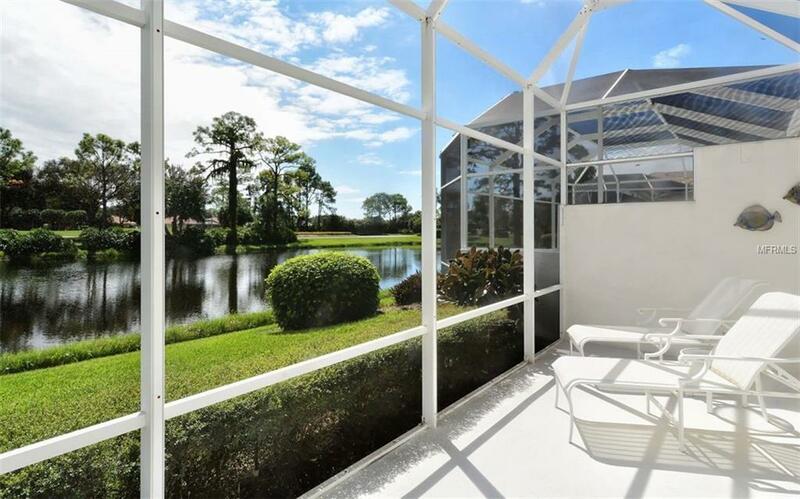 Glistening water views are yours to enjoy from multiple sliders, triple windows in the dinette area as well as from the spacious screened lanai. The bright and open floor plan of this partially furnished 2 bedroom/2 bath maintenance-free home showcases hi-ceilings, a tiled living area and a recently updated kitchen. Newer cabinetry, granite countertops, newer appliances, a breakfast bar and spacious dinette area overlook a comfortable family room. The master suite boasts a walk-in closet and lovely master bath with a soaking tub, double sinks and separate shower. There are hurricane shutters on all openings. A 2-car attached garage, a separate laundry room and large covered entryway are additional amenities. The villa is a short stroll to the many features Stoneybrook offers its members: an 18-hole Arthur Hills designed golf course, fitness center, full service restaurant, 4 Har-Tru tennis courts, community heated pool and spa, bocce courts and many walking trails. Adjacent to The Legacy Bike Trail and minutes away from Siesta Beach, Stoneybrook is a very active social club. BUY A HOUSE ANYWHEREBUY A LIFESTYLE IN STONEYBROOK! !